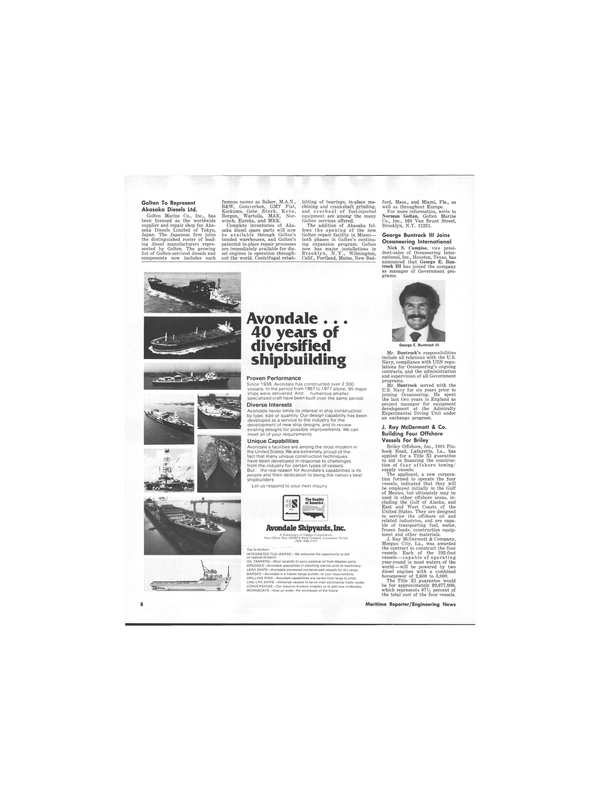 Mr. Finlayson joins APL, having served Marcona Corporation since 1965 in positions as naval architect, general manager-design construction, and since 1974, vice president-marine operations. A graduate of the University of Strathclyde in Glasgow, Scotland, with a degree with distinction in naval architecture, he served as deck officer in the British and Canadian merchant fleets, and as an officer in the Royal Canadian Navy. He has also held various positions with Philip F.
Spaulding & Associates, a Seattle, Wash.-based consulting engineering firm specializing in naval architecture. Mr. Finlayson is a member of the American Bureau of Shipping Committee on Naval Architecture, and The Society of Naval Architects and Marine Engineers.